API service technicians are experts in machine tool laser alignment using API's unique XD laser interferometer system. We also provide volumetric compensations ensuring the best achievable accuracy throughout a machines entire work-space. Our personnel are not only proficient in laser alignment and calibration, but also experts with machine controllers. API provides solutions to partners Siemens, Fanuc, Fagor and others. Correct alignment of components and assemblies lead to higher quality and longer life cycles. API qualified and experienced alignment team are available to support your project. "Review your next alignment project with the experts." API's laser alignment service will maintain your machine tools in good working order by ensuring proper alignment. API Services offers an economical and efficient laser alignment solutions for your machine tool. 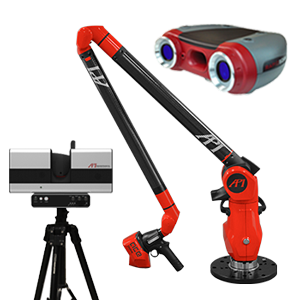 API’s volumetric calibration of large machine tools uses a precision laser tracker with interferometry, featuring the same capabilities of a traditional laser interferometer. The laser tracker offers the enhanced ability to track the machine’s tool-tip location throughout the entire machine volume measuring 21 error parameters for 200–400 locations.